It's what I think I will call these wonderfully tangy sandwich cookies. Calling them macarons is too scary. It was my first attempt to make such Parisian pastry. But I think I did not do 100% justice for them to be actually called macarons. So I'll be going back to the drawing board or in this case the whisk and the whites to have a few more goes. In the meantime thought I would tell you about a fantastic little get together we had just a few days before Christmas. Ever since Soeren started pre-school at the International School in August, I have had the pleasure of meeting and making friends with a wonderful woman - A. Her daugther, J., is in Soeren's class and we see each other often outside of school. She runs a home for physically and mentally abused children. The home is actually a kind of a farm with horses, goats, rabbits, hens and other animals. It's a wonderful place for children from all kinds of backgrounds and we have had the great opportunity to meet a few of the caretakers that work there. One day when we were all sitting down in their huge kitchen with some of the children and the caretakers I mentioned Lydia's fantastic cause where people get together, bake and decorate cookies and then donate them - Drop In & Decorate. As I was explaining this to them a light bulb seemed to go on in my brain. At the same time I saw A. 's eyes light up. We both had the same idea. Wouldn't it be great to get the all the kids together and have such an event right there in the home? The kids loved the idea and soon we were planning the best day, looking up recipes for cookies and making shopping lists. We decided to go for Lydia's Sugar Cookies and her great and easy Royal Icing. These were simple enough and would be fun to make. Once again I really have to point out what a gift these fantastic caretakers have. They were so comforting, loving and amazingly cool. Some of the coolness rubbed off on me too and with a kitchen-load of 8 kids and 4 adults we set out to bake out own Drop In An Decorate cookies. We made an impressive batch of cookies and each one was proud of the part they played. We were well organized and followed the tips and tricks I had written a little earlier in the month about Baking with the family on The Daily Tiffin. It really made things easier. In the end the idea was for these lovely kids to keep the cookies for themselves and for those who were to be going back to their parents over Christmas they were to give them the cookies as a gift. But these kids, as hard a life as some of them have had, were incredible. They all decided to take the cookies to the children's ward at the hospital and donate them to the children suffering from many serious illnesses. It was incredible to see smiles on all the kids. Soeren and J. were estatic at the thought of being a part of this. Somehow I felt proud of Soeren for simply taking part in the event. The kids at the home were excited to be the ones actually doing good for others, who they thought needed it more. The kids in the hospital - well they were simply over-joyed at not only recieving sweet and beautiful treats but also to have a whole lot of kids to play with for an afternoon. Pictures? No, I kept my camera in the bag. Somehow I felt this was simply a moment to enjoy without having the stress of taking pictures. I think it might have also tensed up things if I had taken my camera out and started taking pictures. It was a quiet and lovely time we enjoyed. Hope you all come back here on the weekend to check out all the other great Drop In & Decorate sessions that were happening all over the world as part of the latest Monthly Mingle event. In the meantime I share with you some delicious and zesty lime kisses. A fantastic combination of crunchy shells, while being moist and chewy on the inside and the zangy lime buttercream filling that finally rounds up a wonderful macaron-like experience. Kisses - not macarons! From me to you! Pre-heat oven to 120 degrees C. Line a baking tray with some baking paper. Wash the limes with hot water and finely grate the peel. Squeeze the juice out of the 1/2 lime. Beat the egg whites with the salt untile stiff, then slowly add the sugar. Beat until glossy peaks have formed. Carefully fold in the almond powder and the zest of 1 lime. Fill the mixture into piping bags with a plain tip and pipe out small circular dots on the baking tray. Bake in the oven for 60 mins, making sure they do not brown. Bake the baisers until crispy. Allow to cool. In the meantime whisk together the confectioner's sugar with the butter until a thick, smooth and creamy mixture is formed. Add in the remaining lime zest and 2-3 tablespoons of lime juice. 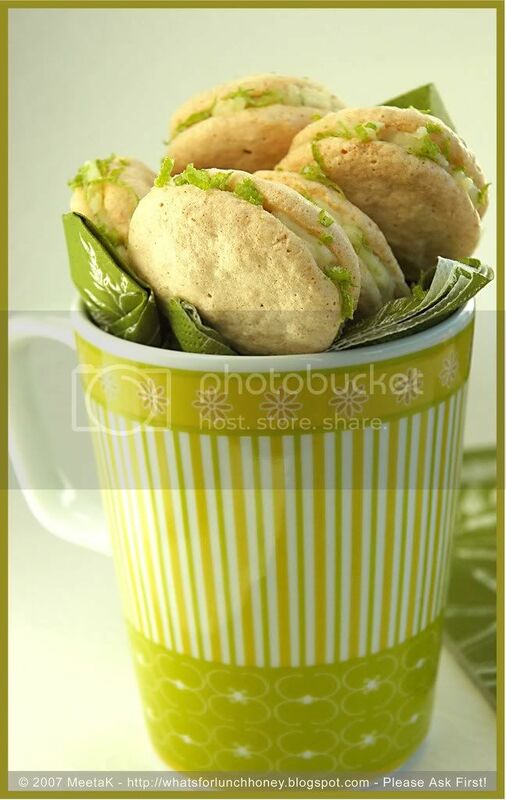 Assemble the cookies by spreading the lime buttercream on the bottom of a baiser and then close with a second. Gently press together. These were refreshing treats. Tangy, zesty and simply delicious. Leaving them for a day gave the aromas the chance to infuse well and created a softer and chewier cookie. These were very different to the other type of cookies we baked simply because of the wonderful fruity flavors. tat;s such a cool pic. i mean cool in the literal sense of the word. I love the colors esp that of the napkin you have used. what's the theme for MM this month? coming up with one soon? Gosh, call them whatever you like but please save me some. So pretty Meeta. I keep thinking one day the DBs will do these and then I'll be stuck. Your cookie party sounds perfect. Your drop in and decorate story was very heartwarming and these lime kisses - well... perhaps if you could just pop a few in the post. It will be okay if they break up a little on their journey as I'm sure they'll still taste perfect! The colour pops out in these photos, Meeta. Particularly the napkin. I have been wanting to make macaroons. In the scale of 1-10 how will you rate the difficulty level? It looks like both adults and kids had a wonderful time. cool recipe!! will try it ...happy new yr..
What a moving story... I'm sure all of you had a great time, no need for pictures, I can see their faces in my head. Your pictures keep on amazing me! I love the combination of colours and the life they have!!! The cookies would be in danger around me!! Anything lime or lemon is doomed to end up in my belly! I love the colors of the picture! It's often hard to make Citrus the main ingredient. It's either too strong, or not strong enough. Very brave of you. Good going. They look perfect and delicious Meeta!! They look so refreshing!! Bet they taste heavenly!! YUM!! 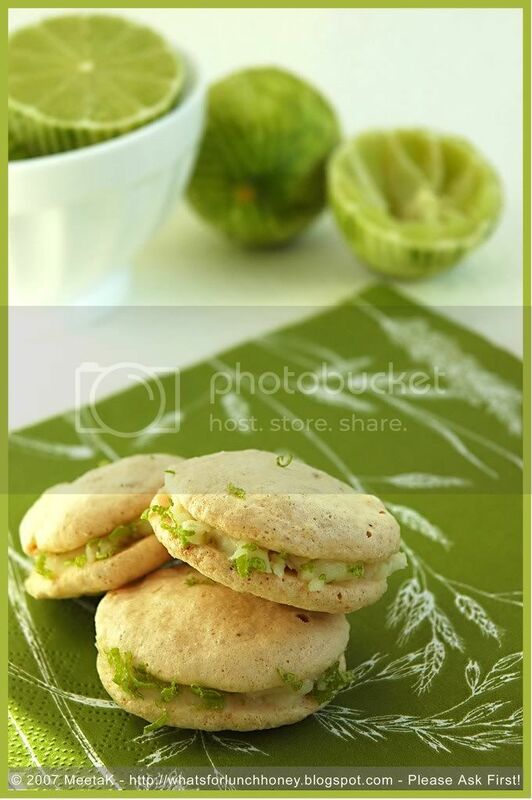 The lime cookies look and sound amazing, no matter what you call them. And your drop in and decorate sounds like it was a huge success! Congrats to you and A! Those do look refreshing. And I almost bought limes today too. Now I am sad I did not. 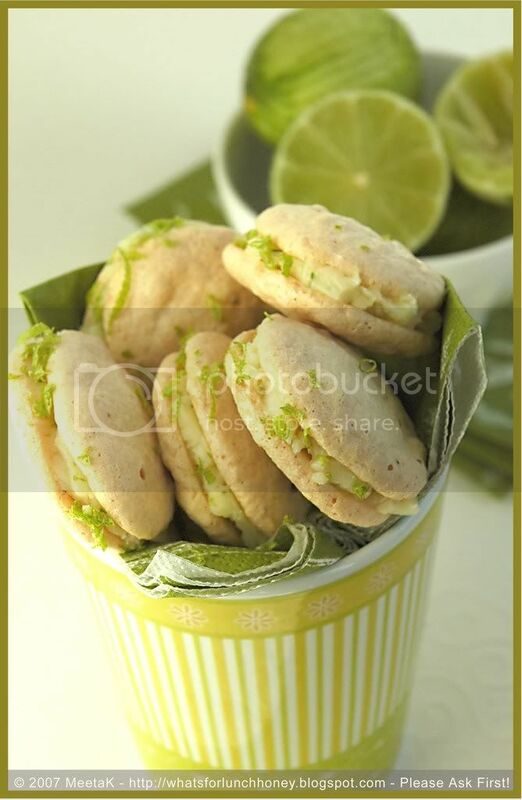 Meeta, you did a FANTASTIC job with these "Lime Kisses" (such a clever name - DEFINITELY better than calling them macaroons). They sound so refreshing! These sounds delicious- light and tangy! And the pictures are so nice, they make me want to make a batch. Thats such a nice colour, I'll have to make them soon. Thanks everyone! These were truly refreshing and scrumptious. Sug - It seems easy enough - one just has to follow the steps very closely. At first I did not and had to throw away my baiser mixture and start again. I would say a 6/7! Yeah, sometimes taking out the camera changes the mood of things. The lemon kisses are so beautiful, I can just imagine how tasty they are. Looks full of spring. These look so refreshing! And while the word macaron can be intimidating to me, who could be scared of a kiss? I would love to try these, Meeta! We use limes all the time here in Brazil, it's a true passion of mine. The cookies are so beautiful! 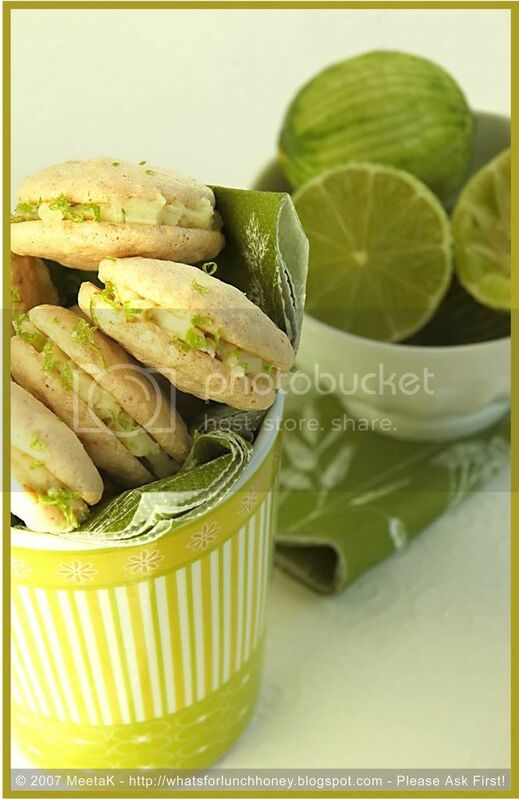 While I love lime, I would never have thought to make cookies in lime flavor! These do look quite refreshing - nice pictures! How delicious! Macarons are on my list to make this year. Beautiful pictures as always, Meeta. I just love the green color. Reminds me of spring I think you did a great job making these. I am still too afraid to try them. I think these look wonderful!! I have really been into citrus lately, and these would certainly hit the spot! The pictures are breathtaking Meeta, I could actually taste the clean refreshing flavor of lime on my palate. My first attempt on macarons looked like yours but they tasted delicious anyway! Am finally able to visit after ages Meeta. Lovely posts, as always. I will not be able to participate in this month's MM... but will participate in the Fberuary MM. I came across your recipes on a random search .And boy am I glad I found you .The Lime Kisses look fabulous.And I absolutely love the way you write and photograph.Will be a regular here scouring for recipes for my kids. Thanks everyone. I also appreciate the encouragement to keep trying on the macarons. I will - will not give up that easily. Thanks for dropping by Poonam. Raaga nice to see you back! I like the simple fresh taste of lime. I will try your recipe next week-end (fingers crossed:) ). Thanks!